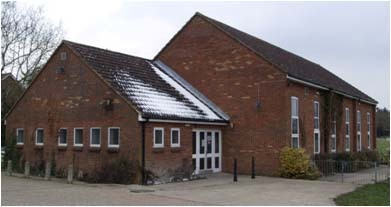 The Hall consists of an entrance lobby with separate Ladies, Gents and Disabled toilets; a main hall with a kitchen and a storage room on the left and a stage at the far end. The floor is marked out for a badminton court. Outside there is a fenced off grassed area that can be accessed from the main hall and a large car park. The Hall has 20 tables and 120 chairs, allowing for a sit-down event for 120 guests. Without tables, the Hall can hold a maximum of 180 people. There are both overhead and wall lights. The stage can be lit separately by spot lights and has full-length curtains and ample power sockets. The kitchen has an electric cooker with 4 hobs, grill and single oven, a larder type fridge (no freezer) and crockery, cutlery and some glassware. There are two serving hatches into the main hall. To enquire about booking, please contact Carol Warren. A vibrant village Hall hosting a variety of sporting, leisure and private hire events.